Eating clean and healthy meals is an essential component to any weight loss regimen. 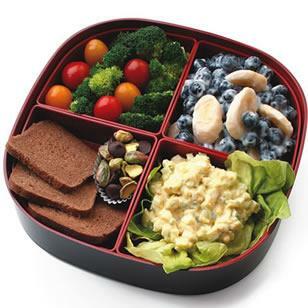 Help control portions by packing your lunch in a bento box! A traditional Japanese bento usually contains rice, fish or meat, cooked vegetables and/or salad. Adapt this idea to fit your needs by organizing your favorite healthy foods into a bento of your own. For example, prepare a low-fat egg salad by replacing fat laden mayo with high protein greek yogurt, dill, sea salt and freshly ground black pepper. Nestle a scoop into a few leaves of butter lettuce or on top of a bed of vitamin rich spinach. Add some small pumpernickel cocktail breads, steamed veggies, a yogurt dressed fruit salad and some heart healthy pistachios punched up with mini chocolate chips and you have the makings of a nutritionally sound and filling lunch! The compartments make portion control simple and are easy to remove and clean when you are done. Kids also love bento lunches. Have fun coming up with new and exciting healthy lunch options! Filed under: Uncategorized | Tagged: bento, Fitness, healthy lunch, nutrition |	Comments Off on Healthy Lunch Idea: Pack a Bento Box! Many people equate the core with the abdominal muscles only. In reality, the core includes shoulders, chest, upper and lower back, abdominals, quadriceps, hamstrings and gluteals. Strengthening the core allows the body to efficiently transfer force from the lower to the upper body and back again. A strong core will allow for optimal body alignment, better balance and less overall fatigue during workouts and everyday activities alike. The following core workout can be easily incorporated into your current routine. This circuit should take about 15 minutes to complete and should be done on non-consecutive days. Be sure to remain mindful, focusing energy on the core muscles being worked during each exercise. Get into a full pushup position with your palms on the floor beneath your shoulders. Hold here for 30 seconds, with your abs contracted and your arms and legs extended and your head aligned with your spine. Do 3 sets of 30 second holds. As you get stronger, try to hold planks for up to one minute. Kneel on the floor and lean all the way over to your right side, placing your right palm on the floor. Keeping your weight balanced, slowly extend your left leg and point your toes. Place your left hand behind your head, pointing your elbow toward the ceiling. Next, slowly lift your leg to hip height as you extend your arm above your leg, with your palm facing forward. Look out over your hand while bringing the left side of your rib cage toward your hip. Lower to your starting position and repeat 6 to 8 times. Stand with your feet shoulder-width apart and extend your arms in front of you at shoulder height. Begin by squatting down, bending your knees 90 degrees, and twisting your upper body to the left. Now come up and repeat the exercise to the right. Keep your weight in your heels and don’t allow your knees to jut forward away from your toes. Keep your knees facing forward as your chest and shoulders move side to side. Begin on all fours, aligning your knees under your hips and your wrists under your shoulders. Raise your left arm to shoulder height and your left leg to hip height. Hold for 2 counts, reaching forward with your fingers and back with your heels. Do 15 to 20 reps, alternating sides. For a bigger challenge, touch your opposite elbow to your knee as you pull your arm and leg in. Lie back in the center of your mat with your knees bent. Lift your head and shoulders and curl your chin in toward your chest. Inhale as you draw your left knee in toward your chest, placing your left hand on your ankle and your right hand on your knee. Lift your right leg about 45 degrees off the floor. Switch legs, extending your left leg while hugging your right leg to your chest. Switch hand positions each time your switch legs, placing your right hand on your right ankle and your left hand on your right knee. Do between 5 and 10 reps for each side. As summer comes to an end and the weather starts to cool, I start to see more members coming into the fitness center, and they are looking for healthy nutrition ideas. It’s finally starting to cool down, so I don’t mind turning on the oven. 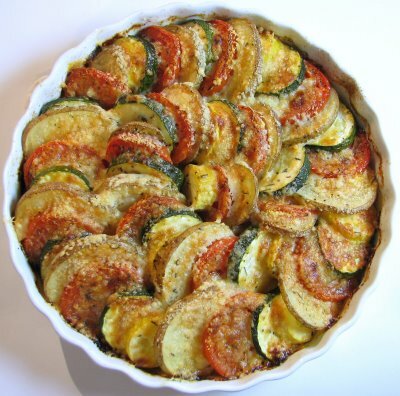 I love this healthy late summer vegetable tian (pronounced tee-ahn), which originated in Provence and references the shallow earthenware casserole as well as the food it contains. Farmers’ markets around the city are abundant with many different varieties of succulent squash, sweet onions, juicy heirloom tomatoes and earthy potatoes. It can be served as a gorgeous vegetarian main course with a nice salad of market greens and a crusty French baguette, or as a side dish to meat or fish. This nutrient-dense tian contains many richly colored vegetables, which serve as a great source of carotenes that protect the body from cancer, heart disease, and type 2 diabetes. These tasty vegetables also provide a healthy dose of potassium and vitamin C. So, enjoy this delicious recipe – guilt free! The Olympics have wrapped up and armchair athletes can take a breather. Not a single athlete has been sanctioned over the use of performance-enhancing drugs. But you, Mr. and Ms. Olympic “Could Be If You Only Made an Effort” Athlete, you are fully entitled to the rush to be gained from endogenous opioid polypeptide compounds. Yes, we’re talking endorphins. No need to go to some sleazy dive, no need for illicit materials, no, the source of these is right there in your very own body. You too can have feelings of exhilaration, a sense of power and control over yourself. How, you ask? Get out of that armchair and stop watching others exercise. Run, swim, bike, take a group exercise class, whatever, it just doesn’t matter, just move something in some direction other than sitting down. (Though of course we do want you to stop moving long enough to read this rant). Exercise helps you manage your weight. Exercise boosts your energy level. Exercise can be — gasp — fun! Really can’t argue with any of that. And may we suggest that the full range of fitness facilities available at the 16th Street J, to say nothing of the nationally-certified personal training staff, are here for you. Run on over (or walk, we’re not particular) and we’ll give you a free day pass to try it out. And if you’re already a member, mix it up a bit—swim if you usually run, take a class if you usually do the bike, try free weights one day instead of the Cybex. And if you ever have questions about membership or fitness, you can’t do better than to go to Lynda Espada, Director of the whole shebang (formally known as the Sport, Fitness & Aquatics Director).